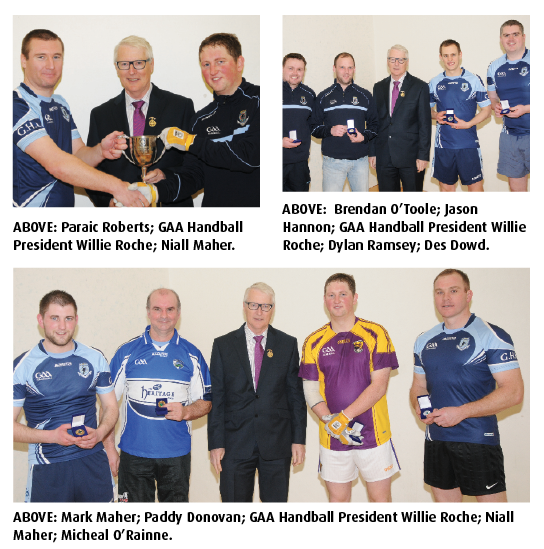 The annual Garda 40×20 championships were hosted at St. Joseph’s Handball Club, Wexford on February 18th 2015. On the day four categories were on display; senior singles, senior doubles, junior singles and junior doubles, with the Hannon Cup being the coveted prize for the senior singles. 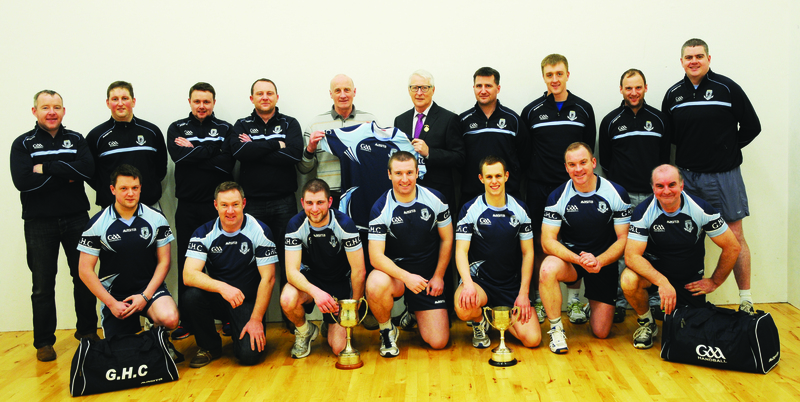 The championships also provided the opportunity for the launch of the newly designed Masita kit for the Garda Handball Club which was presented by GAA Handball President Willie Roche and Wexford County Secretary Tony Breen. This year’s competition continued to portray the growing standard in garda handball with some fantastic battles in the alley throughout the day. Players were delighted that a host of new players entered the championships this year; two of which, Dylan Ramsey and Richard Ryan, are currently training in Templemore as part of the new intake of garda recruits. Following on from a full day of handball the stage was set for four surprising finals, with the favourites in both the senior and junior singles having failed to make the cut. (St Brigid’s, Laois) by his side, whilst his elder brother Niall Maher (Kilmyshall, Wexford) was paired with Micheal O’Rainne (Moycullen, Galway). Donovan as the most successful player playing on the day, demonstrated a master class in the kill shot and seemed determined to succeed in the doubles where he had failed in the singles. He proved too much on the day for O’Rainne and Maher and ensured they took the title. The junior singles had Mark Maher and Des Dowd both in their second final of the day. Maher began with racing off to a 9-0 lead but Dowd then found his stride. Following some massive rallies, much to the crowd’s enjoyment, Dowd pulled ahead to 14-9. It was at this point Maher began to come alive again and press but Dowd, fully in control of the game with some fine passing shots, held to win 21-16 and reclaim a title he had won two years ago, prior to his bad arm fracture last year. No one could begrudge him his victory and all were delighted to see his return to form. The stage was now set for the Hannon Perpetual Cup. Niall Maher and Paraic Roberts (Kilmyshall, Wexford) were in for an all too familiar game. The pair are not only club mates but county doubles partners for several years. However, this was their first meeting in the Garda championships. With the game and finalists being an All-Wexford affair it seemed only fitting a Wexford man officiate. Tony Breen County Secretary did the honours and the game was afoot. Not an inch was given as the fierce game ensued. It was the highlight of the day and came to an end with Niall Maher, following on from his win in the 60×30, claiming the title. He now holds both the Tom Langan and Hannon Cups but has many rivals waiting in the wings. At the end of the day GAA Handball President Willie Roche and County Secretary Tony Breen presented players with their new Masita club jersey. Special thanks is also extended from the club to St Josephs for being a fantastic venue, Wexford Handball Chairman Rickie Barron, Assistant Commissioner Fanning, Chief Superintendent John Roche (Wexford) and Inspector Pat McDonnell (Wexford) for their support in organising the event and throughout the day. The players now have the team of 12 annual exhibition tournament against the Defence Forces on March 26th at Collooney HBC, Sligo. For anyone interested in handball in general or to compete please contact: David Hannon (Collooney, Sligo) ohannain@gmail.com. Beginners and all grades are welcome and will be accommodated.